When I was little, we used to go to a bunch of backyard BBQs and family parties at my aunt and uncle's house. One of my favorite parts, eating applesauce cake made by my uncle's mother (we actually aren't related to my aunt and uncle, they're just family friends). It's similar to carrot cake or a spice cake, but it always comes out very moist and I love a good spice cake anyway. 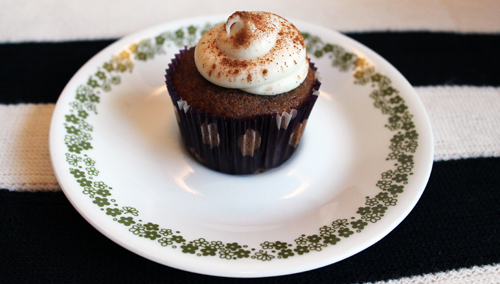 Here's the recipe that I scored from her years ago, and then turned into cupcakes! 1. Sift together flour, baking powder&soda, salt, cinnamon, nutmeg, and ground clove. Set aside. 2. Cream together softening and sugars. Add eggs. 3. Alternate between adding dry ingredients and applesauce. 4. Fill cupcake liners 3/4 full. 5. Bake for 15-17 minutes until golden brown. 1. Cream butter and cream cheese together. Add vanilla. 2. Gradually add powdered sugar. Use milk to get to perfect consistence. 3. 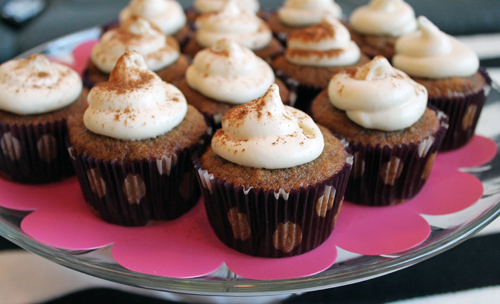 Use pastry bag and piping tip to pipe frosting onto cupcake. Dust with cinnamon!